The old communication playbook no longer works. What worked before isn’t working anymore. It’s time to rethink communication and leverage the greatest opportunities we’ve ever had to communicate in the church. In Rethink Communication, Phil Bowdle walks through the new reality for what attendance, engagement, and attention look like for the church. Then he offers a practical communication playbook you can use to communicate anything in your church—and actually connect. These practical tips and proven strategies will work regardless of size, staff, or budget. Communication has been overlooked for far too long in the church. It’s time for that to change. Church communication a tough gig. Some days it feels like you need superpowers. Find courage and inspiration by looking back at heroes who faced similar odds and had the same human limitations we do. Heroes such as civil rights pioneer Ida B. Wells or the creative genius Albert Einstein. We get it: Church communication can be a challenge. You feel overworked, overwhelmed, and overloaded. More than the bulletins, goofs, and calendars, it’s the stuff behind the stuff that’s really taxing: unmet expectations, perfection paranoia, and demoralizing doubt. But you’re not alone. You’re telling the greatest story in the world, and you can do this. Let’s get started in church communication. 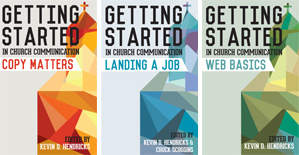 This series covers writing, websites and landing a job, three volumes available separately or collected in one handy ebook. Each volume is full of practical tips and expert insights, a how-to guide that can get beginners going and help inspire and refresh the pros. Copy Matters – The written word needs to be written well. Landing a Job – Your new job is waiting. Web Basics – Here’s to church websites that wow. 3-in-1 – All three ebooks together in one handy collection (save $1).